Lifetime has had many different table designs. They have mostly focused on light to medium-duty uses. As such, these tables featured warranties lasting at most 10 years. Now, with a new design and stronger legs, these new Lifetime Professional Grade Folding Tables come with a lifetime warranty. The weight capacity of these tables also jumps up considerably, from about 1400 lbs. for a medium-duty 6-ft. table up to 2000 lbs. on the 6-foot professional-grade Lifetime table. These are not your Grandma's folding tables. Get some information about Lifetime tables here. 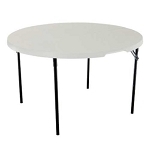 Lifetime Products currently makes these tables inch 6-foot and 8-foot lengths. The only color of plastic currently available is gray. These different sizes also come inch different package configurations. 6-foot professional grade Lifetime table single pack, Lifetime Professional Grade 6-foot table 4 Pack, and 6-foot Lifetime professional grade table pallet pack. In 8-foot model we have the 8-foot Lifetime professional table single pack, the Lifetime professional grade 8-foot table 4 Pack, and the Professional grade 8-foot Lifetime table pallet pack.